A hurricane is a giant storm that is destructive and it can destroy a city and it could kill a lot of animals and people. The hurricane causes this damage with powerful winds and flooding. The wind and rain cause terrible destruction. 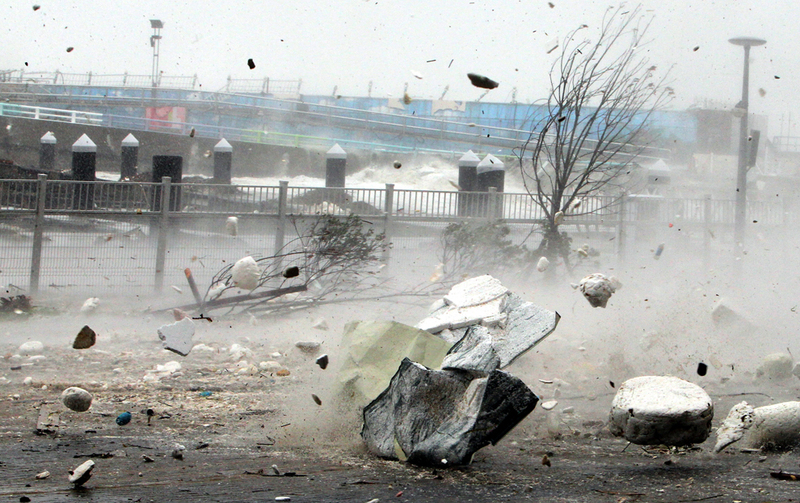 Hurricanes are very strong storms that can flip over cars and make trees fall. Hurricanes are also natural disasters that can cause deaths, injuries, and billions of dollars of damage. This picture of Hurricane Elena from September 1985 shows the entire hurricane, including the eye. Winds from Hurricane Dennis blowing trees. Step 1: Build an emergency kit. Step 2: Make a family communications plan. Make sure your family knows what to do if a hurricane is coming. Step 3: Cover all your home windows. Step 4: Secure your outdoor furniture, planters, and other loose items. Step 5: Do not go outside. Step 6: You have to get food that is in cans. Step 7: Listen to the radio for updates. Step 8: Save a shelter phone number in your cell phone. Step 9: Do not go inside your car. This home has been prepared for a hurricane. The windows are covered with plywood. This picture demonstrates how unsafe a hurricane can be. You have to stay inside your home. Stay away from windows and even glass doors, because you can get injured by the glass if it breaks. To not starve, find a way you can keep your food safe. Put it in a cooler with ice. For your safety, avoid using electrical items except for real emergencies. Don’t use the elevator if there are elevators at your home, because if you get stuck during a hurricane and that building falls apart you will be trapped. Keep listening to the radio. Do not go into burning houses or houses that smell like gas. Do not go or leave your house unless it is safe. If you find someone in danger, you could save them, but in a way where you do not make your self get in danger also. Be careful for flooded areas. Stay away from large buildings, because they could fall. You need to be careful with your food, if you lose power. Your food might go bad. 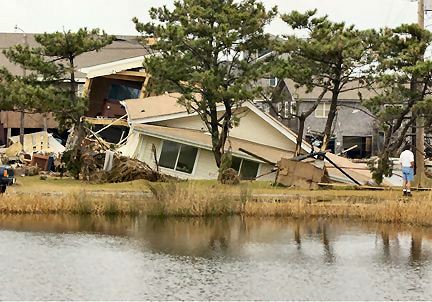 This picture shows a house sinking after a hurricane struck.